I’ve lived in South Walton for quite some time now, and it’s a special place for sure. We have some of the most beautiful beaches anywhere, a variety of fresh, local seafood at our fingertips, numerous talented artists and musicians, and a slower pace of life. Yep, I feel pretty darn lucky to call 30A my home. Many visitors to South Walton Beaches are curious about what it’s like to live here full time, and the locals, population 12,000, can be a bit tight-lipped when asked about their little slice of paradise, aka the Florida Panhandle’s Emerald Coast. As a local, I’m stepping out of the darkness, and into the Florida sunshine to share a few of our 30A local’s secrets with you. Shhhhhh, please don’t tell the other locals. I might lose my secret leather and pearl decoder ring. 30A Secret #1 If you’re an oyster lover, they’re plentiful here, but you may not be familiar with the extraordinary shrimp phenomena called, the Royal Red. They’re the most delicious shrimp on the planet, almost a cross between a shrimp and a lobster, and if prepared properly will change your life. The local restaurants don’t serve them, so you have to purchase them at Publix or Buddy’s Seafood Market and take them home. They will steam them for you, or you can prepare them at home, but don’t overcook them. They’re only found off of Florida’s coast in the deepest waters where the ocean floor abruptly drops off the continental shelf and a few places in the Gulf of Mexico. They’re also seasonal, typically harvested late summer through fall. 30A Secret #2 Beach launching fishing boats off Grayton Beach is one of the coolest things you’ll ever do or see. South Walton issues a limited number of commercial beach fishing permits to a few lucky, local boat captains; to be sure, you can catch Capt. Larry from Dead Fish Charters, Capt. Kerry from Not A Dog Charters, or Capt. Mark from Fishy Booty Charters launching off for a day of fishing if you’re there at just the right time. These experienced fishermen will take you Bottom Fishing for Snapper and Grouper within 6 miles of the beach, or Surface Fishing for King Mackerel, Spanish Mackerel, Bonita, Amberjack or other migratory fish passing through. If you’re here during early spring you can go Cobia fishing, a local’s favorite! Grayton Beach is usually right in the middle of their westerly migration. Warning: Book early, rumor has it Capt. Larry is booked 6 months out. 30A Secret #3 The Pickled Pickers are the coolest, hottest, newest band on the “A”. Featuring long-time favorite local musicians Tim Jackson, John Hoorman, and Tim Bali Prescott, as well as a new kid in town, Mark Gillespie. If you haven’t witnessed Mark Gillespie pick a guitar, then you need to add this to your bucket list. He toured and played with Trace Adkins for over 10 years, and is a-m-a-z-i-n-g. However, the hottest rising star in this group is Krissa Quill Gillespie. Her incredible voice is a cross between Janice Joplin and Aretha Franklin, and she will rock your flip-flops off! 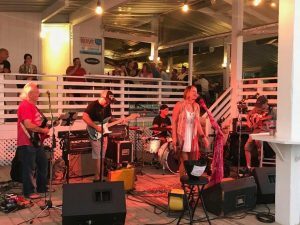 They play a mix of southern rock, blues, R&B, blue grass, and just general feel good to the soul kinda tunes at AJ’s in Grayton Beach every Sunday from 4:00 to 8:00. If you’re really lucky, the Godfather, Unca Duke, will make a surprise appearance. He played with a guy named Elvis. You may have heard of him? To all of our spring and summer guests this 2018, “Welcome to paradise… kick back and relax… you’re here and we’re glad to have you.” Please remember to obey our beach flag warnings for your safety and the safety of our life guards and emergency service providers. Also, May 1 through October 31 is sea turtle nesting season. Please visit http://www.southwaltonturtlewatch.org/ for more information on keeping our sea turtles safe while enjoying our beautiful beaches.